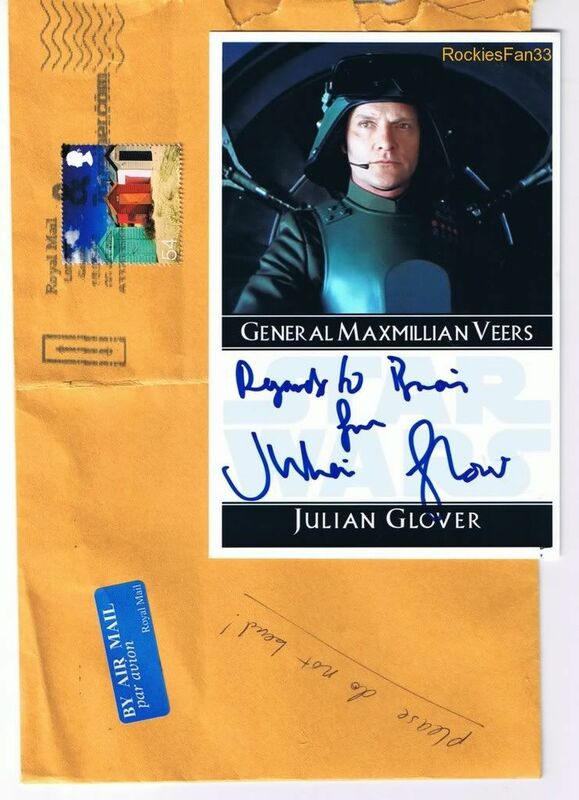 Heres a picture of my Julian Glover signed Veers action figure, received back in 4 days!!! Hey Vader Nation! Awesome success! Julian is really good with fanmail! Keep up the fantastic job! I totally forgot about this guy. Thought he was great. He really played off the Imperial snakey evilness in the best scenes in the OT. I LOVE SILVER SHARPIE SUCCESSES!!! Mr. Glover signed all 3 CCGs I sent him and signed in.. yes.. silver sharpie. best looking success so far. Took 12 days (inside europe). Sending out two 4x6 pics tomorrow, hoping for a huge success here! Success after only 14 days!!!! Mr. Glover signed both of my 4x6 pics (ISP). I sent a return envelope with $3 cash along with my letter to the address below. Thank you so much Mr. Glover! Got a reply from Mr. Glover after only 12 days! Sent 02/14, received 02/26. Signed my custom Star Wars, Indiana Jones, Game Of Thrones and James Bond cards, and my photo op from Celebration V! Scans are on my websites in my signature.